How do I teach my child to write numbers? How can I make my kid write the same number many times? How do I know my kid is writing numbers correctly? You will find all answers to these questions in Boo Numbers! Just start using our app, witness how much your kids love handwriting and track the progress using special features in the program! This is the answer to your first question - How do I teach my kid to write numbers? In Boo Numbers after kids watch the demonstration of how to write a number, they trace the number 3 times. Every time the number is different visually and the level of prompting gradually decreases each time through. First time kids trace the number, emphasis is given to identifying the proper starting point. The second time through learners must stay approximately within the lines and make a complete stroke without the finger leaving the screen in order to complete the task. If they stray or lift their finger, they redo the segment. 3rd time kids trace the number, the app tracks if kids learned to write the number – the starting points, order and direction of each of the number segments. If several mistakes are made, the app will demonstrate how to write the segment. How do I make my kid write the same number many times? 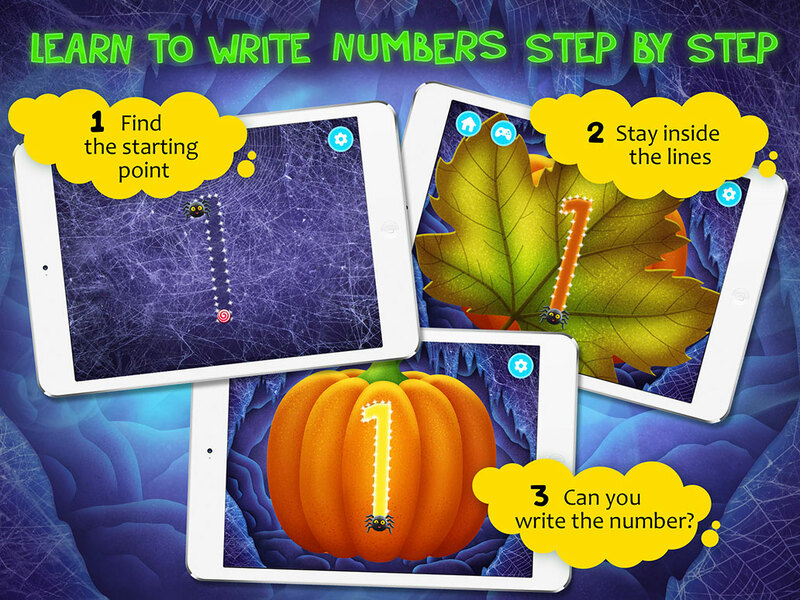 The Boo Numbers app is so cheery and full of positive reinforcement and encouragement, kids will view tracing as a game. They have a choice of scratching out letters on a frosty window or munching through numbers imprinted leaves or spider net. After completing a series of numbers kids earn a reward (a mini-game). What little ones won't realize is even these mini-games are building their fine motor skills and helping develop the control they will need to write. How do I know my kid is writing numbers correctly? If your kid writes letters on paper and you don't stand behind your kid watching him/her writing, it is hard to say if the numbers have been written in the right way. 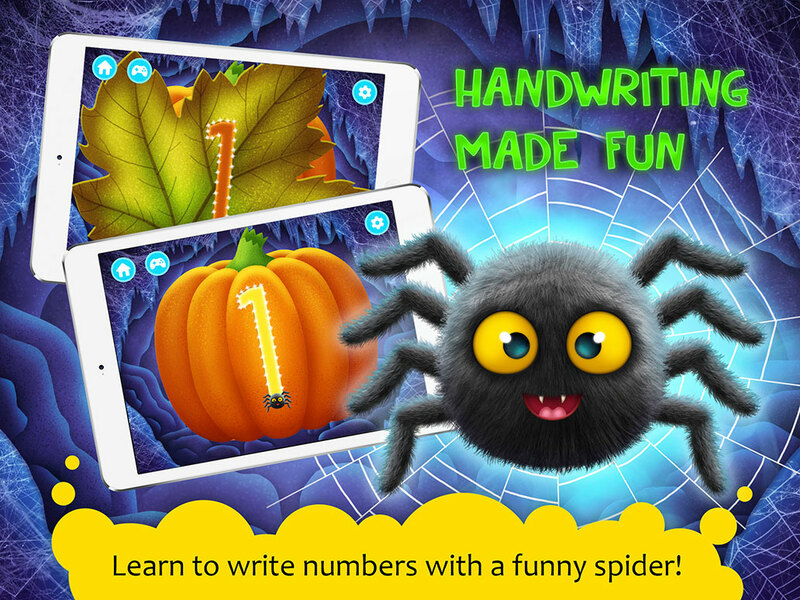 Boo Numbers app tracks if the child has learned to write a number based on how the exercises for this number were done. The evaluation depends on whether the child stayed in the line, started writing the number from the correct segment and from the correct point. The number acquires the status «learned» (with a green background in the kid's corner or adult's corner). The app tracks 2 kinds of mistakes: when kids start writing numbers from an incorrect point and when they are out of line while writing the number. So we hope our app will be useful and helpful both for kids and parents and will prove that learning may be fun!